1. In a saute pan, saut� the green onions in olive oil over moderate heat. When they have softened (about 3 minutes), add spinach, parsley, salt, pepper, and dill. Continue cooking just until the spinach has softened. Remove from the pan and place in a bowl. 2. Add feta cheese to the spinach mixture and keep warm. 4. Cook the eggs for 3-5 minutes or until the whites are solid and the yolk is still soft. Remove eggs from water and season with additional salt and pepper. 5. 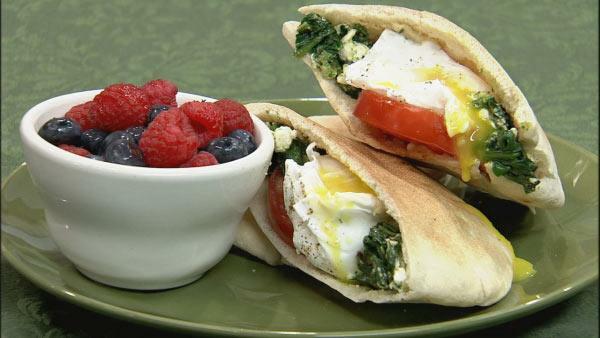 Warm the pita bread halves in the oven or on a griddle. 6. To complete the dish, smear hummus on the inside of the pita breads. Then fill with spinach and top with a seasoned egg. Slide a tomato slice into the pita and serve immediately.